The Neo for Iwata TRN2 side feed pistol trigger airbrush is preferred when working in medium to large sized areas with a larger amount of paint. 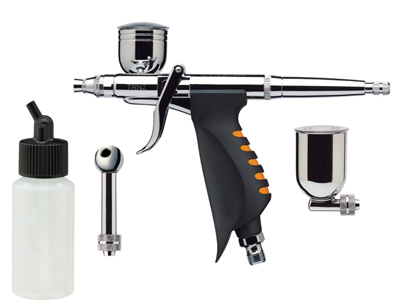 This airbrush includes a 1/4oz (7ml) and 1/2oz (14ml) gravity side feed cup and a 1oz (28ml) Iwata Big Mouth Bottle (also compatible with other sizes of Big Mouth Bottles and Iwata bottles). PTFE needle packing and solvent-resistant in all paint-bearing areas. Air Pressure: Recommended operation is between 10 and 60 psi. Size 5 Colour Adjusting Part for H.